The response of most Manchester United fans regarding that question will be Luka Modric. Easy. Luka’s grace when it comes to playing football, whether it is for Tottenham (probably not for very much longer) or for Croatia, is undeniable. His capabilities when it comes to floating over a tackle in a Messi-esque movement or threading an exquisite through-ball to one of his teammates have been demonstrated many times over the past few years and the constant links with great teams such as Manchester United and Real Madrid prove that he is in the top tier of midfielders in the footballing world. His price tag shows that too. Around £30 million isn’t a price many can afford. Sure, Real Madrid and Chelsea spend that daily on cupcakes for their staff, but for a club who, as every Red Devil will know, is in a certain financial difficulty, Modric appears to be slightly out of reach for Manchester United. The signing of Shinji Kagawa showed that United are still able to compete in the higher tiers of the transfer market but, let’s not forget, Kagawa was in the last year of his contract and had stated quite some time before his intention to leave at the end of the season. Modric, on the other hand, has quite a few years left on his contract (ends in 2016) and, even though he wants to leave, Daniel Levy will not let him go without a fight and a hefty cheque in the club’s pocket. Leaving Modric to one side for now, other United fans are calling for a defensive midfielder in the Roy Keane mold. Let’s be honest, Manchester United have not owned that type of player for a few years now and have managed fine without him (4 Premier Leagues amongst other trophies and finals). Fletcher was never a gritty in-your-face midfielder; he got the ball from the opposition’s players and passed it on like Keane did but rarely would you see him try and “munch” someone with a heavy tackle. Sadly, it seems that Darren will not be able to play top flight football again due to his illness, leaving another gap in United’s midfield. If one was to look at the rest of our midfield, only Carrick and a very aging Scholes stand out as “top midfielders”. The likes of Anderson and Park will probably be sold in the near future, Cleverley will need time to develop given his proneness to injury and as to Pogba, well, let’s just say that his hike to Juventus should come to term on the 1st of July. He’s not there yet, but he most probably will be. What Manchester United seem to lack is someone who is a bit of both; a box-to-box midfielder. Someone who can pick the ball up in front of the defence and end up in the opposition box, either getting an assist or powering a shot from outside the box. Someone who can complement Carrick’s passing abilities down both ends of the pitch. Someone quite different to Luka Modric. Someone like Yaya Touré. Unfortunately, Yaya Touré plays for Manchester City and is highly unobtainable. However, two of these players exist who would probably leave their club for a bit less than the £30 million price tag that papers are slapping on Luka Modric. 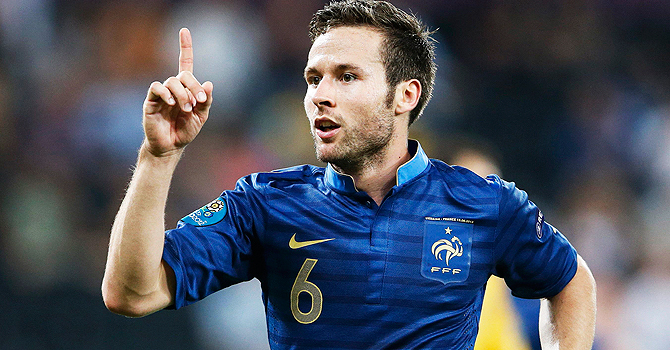 Yohan Cabaye would be the easiest to buy. Pardew has already said that if someone like Manchester United were to come in, it would be very difficult to stop his prize midfielder from leaving. His passing ability (80.4% success rate with an average of 1.6 key passes/game) to feed his two goal hungry Senegalese teammates caught the eye of many pundits, yet a lot of the time, he seemed happy enough sitting back alongside his more defensive side-kick Cheik Tioté when called upon to do so. Throughout the season, he averaged 3.4 tackles per game and 2.6 interceptions (both higher than Tioté’s (2.8 and 2.5)). In addition to these diverse statistics, he possesses a certain skill regarding set pieces as demonstrated in a wonderful 30 yard free-kick vs Manchester United in that woeful 3-0 defeat on the 4th of January. Another potential target, Nuri Sahin, is a name many will have forgotten over the past year. Following two wonderful seasons at Dortmund, he was sold to Real Madrid for an annoyingly low fee of around €10 million. Unfortunately, he never really managed to maintain a place in the first team squad due to a combination of injuries and others performing extremely well. His name has crept up lately in the “Modric to Real Madrid” deal as Tottenham have reportedly demanded Nuri Sahin in return to fill the gaping void a departing Luka would leave. In his last season for Dortmund, he managed to amalgamate 8 goals and 13 assists from a very central position (3 more goals and 7 more assists than Modric managed last season) and 6 goals and 9 assists the season before that. If used correctly, Nuri Sahin can dictate the tempo of a game, much like Scholes can but, unlike everyone’s favourite Ginger Ninja, he possesses a certain savvy in the area of tackling. His availability, however, is something of a mystery. Having only signed last season, Mourinho will not want to let him go for anything less than what he signed him for, so a price of around £10-12 million could do the trick but the Special One isn’t one to let his players leave cheaply. Joao Moutinho also falls into this category but his performances during Euro 2012 will have inflated his price sharply. The fact that Everton have been looking to buy him the past 3 seasons shows how cheap he could have been but with Porto’s reluctance to sell players i.e. Hulk and James Rodriguez, his price will be one very similar to Modric’s. Having signed Powell and Kagawa, Manchester United are not exactly looking for a “creative” midfielder. Many are suggesting that Powell will be thrown in the deep end and be a part of the first team squad next season and with the likes of Cleverley in the ranks, a player like Modric is not a complete necessity. As stated above, for all of the fans calling for an enforcer, Manchester United have managed fine without an out and out defensive midfielder for quite some time now. What Manchester United lack is someone who will allow Carrick to play his “spraying” game and achieve 90 odd percent of pass completion whilst being able to play equally well in defensive and offensive situations. Many will disagree with this post and hopefully, many will agree. Regardless of the views and voices of the fans, the power is in the hands of a 70 year old Scot and, as Reds around the world know, he has very rarely failed to bring success to the club in the past 15 years. In SAF we trust.